It doesn’t really seem appropriate when someone over the age of 50 is still called a student – even if it’s always respectfully applied to those of the noted Becher School. This pigeonhole is too cramped for Kris Scholz; he rose above such categorizing already at the start of his career. Not that varying perspectives were lacking in the photo class of the Düsseldorf Art Academy, but Bernd Becher, who wasn’t much for words, found his own ways to express his views through either encouraging or ignoring individual views. Whoever followed in his footsteps undoubtedly had it easier than those who frequently thought along different lines. Nevertheless, the diversity of outlooks among Becher’s students was much larger than one would generally like to think. 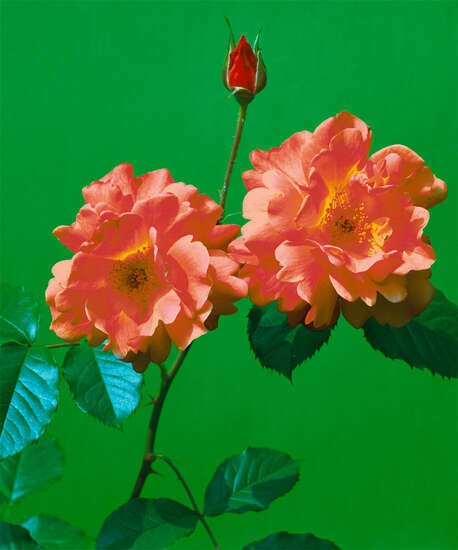 They ranged from artists such as Andreas Gursky, who focused on massive scales and fragmented them into colorful pixels; Axel Hütte, who committed himself to emblematic naturalism; to Kris Scholz, who always plays with references from art history in order to step up to near hyper-realism. As great as the differences may be, all the “Düsseldorfers” have something that binds them: the absolute perfection, ultimate focus, and fine grain of their photographs. 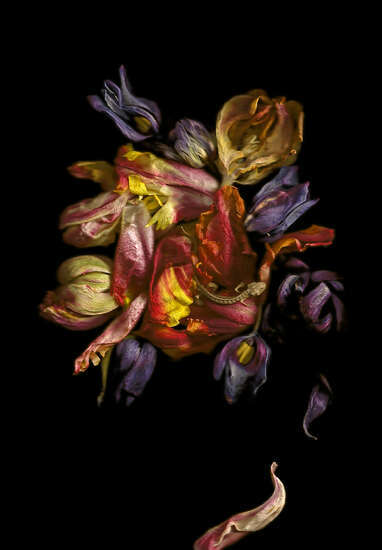 Scholz achieves a breathtaking vividness in his still-lifes with flowers. With white light, he meticulously shapes the objects, vases and blooms, which, from their artificial dialog, melt into a nearly inseparable oneness. As droll and tasteless as some of the vases are, they bloom under Scholz’s observation and gain the flair of sculptures. By isolating and monumentalizing it, he bestows permanence upon the perishable ensemble. His aesthetic concept is to record what, to him, are optimal situations. Sometimes it’s the culminating peak between blooming and wilting, sometimes the obvious state of decline. The photographs become a special kind of snap-shot, and their perfection is raised nearly to the point of being maddening. With the help of photography and against all rules of nature, Scholz forces the moment of absolute beauty to linger. 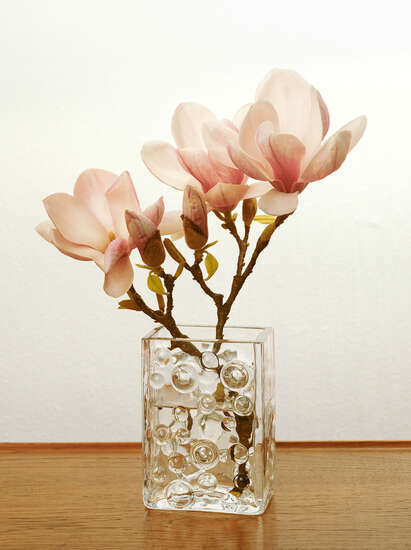 A clear flash of irony is noticeable in the vases, which lag behind the uplifting grace of the blooms in their design. In the competition between nature and man, man clearly falls short with his reflexes, his concepts and his reason. For the photographer it’s less about an illusion as cultivated by Dutch painting of the 17th century, and more the overreaching realities that lead to a new perception of things. 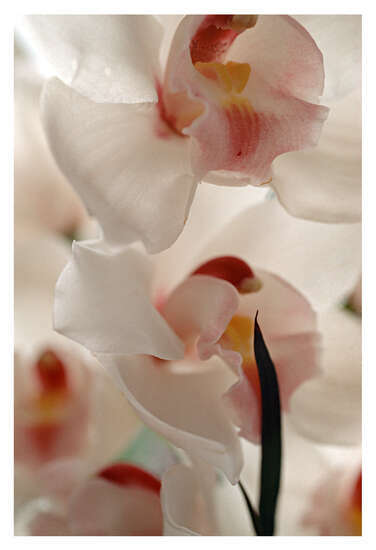 He transports nature into the spheres of the artificial and awakens new associations that transcend the underlying term “flower still life.” Does the series of rose, magnolia, hawthorn and amaryllis perhaps have much more to do with a presentation of the four temperaments? The clear allusion to the history of European painting which has such widespread symbolism could be closely related to this. Scholz’s photographs of isolated high-rises may be reminiscent of one of Bernd and Hilla Becher’s rows of blast furnaces and winding towers, but it’s about the design phenomena of the miracle economy, not typologies. It’s about the strangeness of this post-war achitecture. 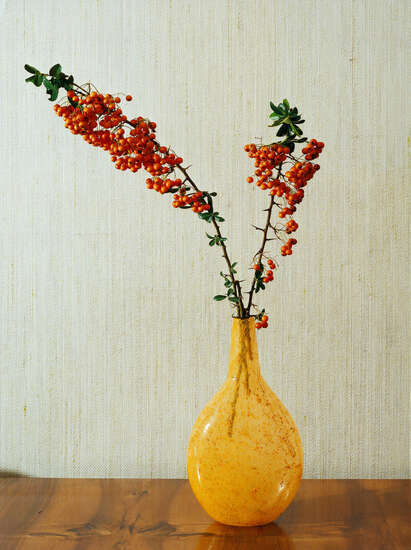 The flower vases are the striking counterparts in which the same aesthetic finds itself again. It’s made wonderfully possible by photography: the small becomes large and the large becomes small. 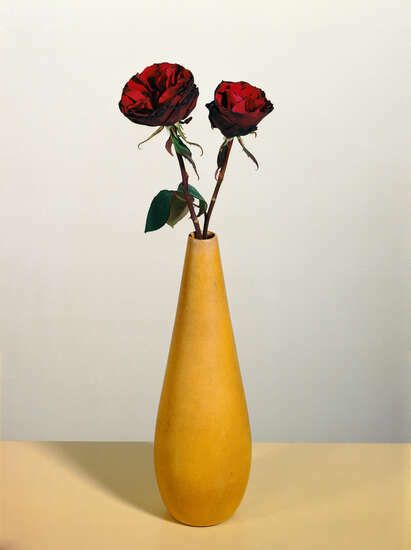 Building and vase receive the same dimensions and also begin to breathe the same spirit of that positivist break out time in which Scholz spent his childhood and which today appears bizarre in its often endearing mustiness. 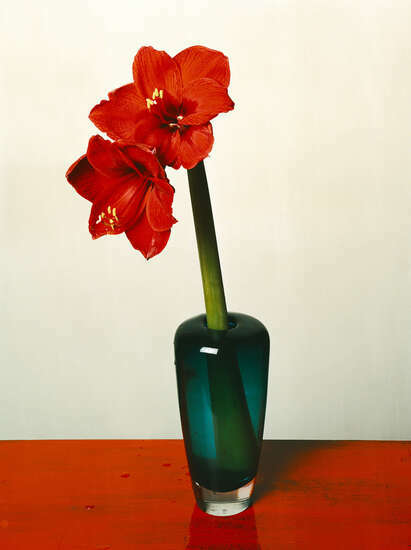 Flowers are also found in other places in Scholz’s work. 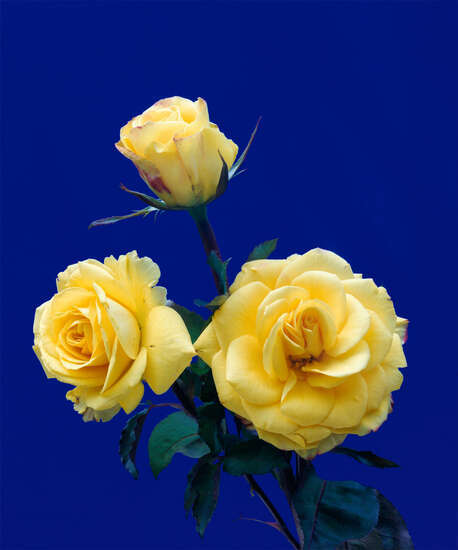 In the series of various roses he achieves an extremely unnatural effect through color contrast. 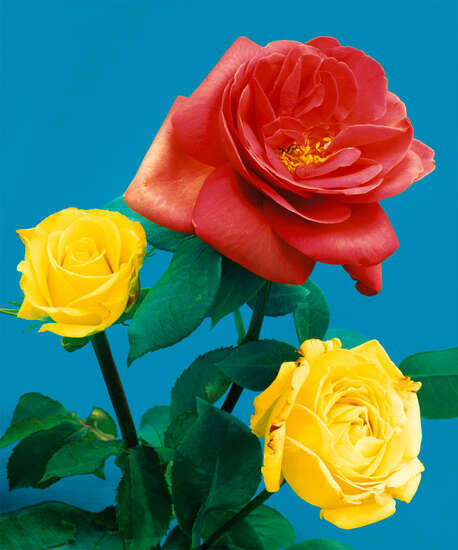 The yellow and pink-red blossoms are illuminated in front of intensely colored to garish monochrome surfaces as if they wanted to rival the backgrounds, which between the two have more blatant artificiality to offer. It’s an undecided trial of strength and at the same time an interplay between smooth surfaces and organic forms; the two parties escalate against each other. Such a relationship between dominant background and actual subject is also found in the portraiture of Scholz. There the blurred scenery seems to point to speed and elapsed time while the model, in the classic, rigid Renaissance pose, remains uninfluenced by it. 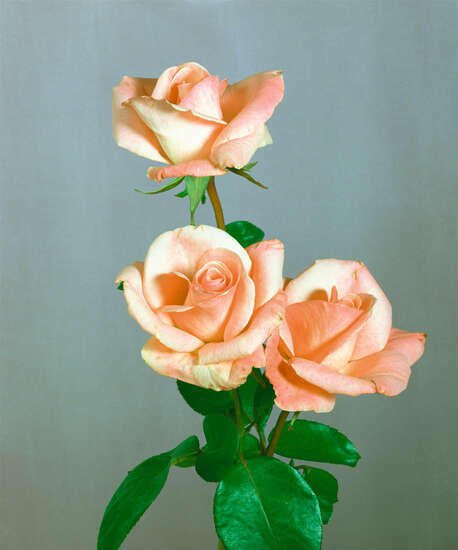 The still-lifes put this ambivalence before the eyes in an even more radical way. Colors and forms are compressed in purist decadence and one has to forcefully tear ones eyes away since one doesn’t want to fall under it’s spell. It is probably the archaic enthusiasm for kitsch that’s being provoked here with an unmistakable wink. Based on old-fashioned congratulatory cards from Italy, which are used for any conceivable occasion, Scholtz lets loose by blowing up and setting the subjects against each other, lending them a meaning that forcefully leads to a well-calculated crash. Paralyzed by the superiority of the pictures one can easily ask the question once again: what is kitsch and where does it begin? Without a doubt, Kris Scholz knows the answer. 1992 Spirit Arts Gallery, Santa Fe, U.S.